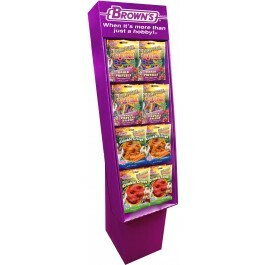 Our free-standing treat display offers a great “impulse buy” opportunity for your customers. Convenient and easy-to-use, this easy to assemble display is a great way for your customers to find exactly what they want. Brown's® Tropical Carnival® Baked Pretzels Small Animal Treats are a fun and interactive treat for rabbits, guinea pigs, chinchillas, hamsters, gerbils, rats, mice & other small animals. Our berry-flavored Baked Pretzel Treats are easy for small animals to grasp and carry, making feeding time fun & exciting. They're a great chewing treat for optimum tooth health. Tropical Carnival® Crinkle Crisps® treats have special dental ridges designed to promote tooth and gum care. Small animal teeth continuously grow and require constant chewing and grinding to keep them worn down. The special porous texture and dental ridge design work in conjunction with your animals chewing to ensure their overall tooth health. Your pet will crave the super tasty real fruit & veggie recipes!